For other uses, see Venison (disambiguation). Venison is the meat of a game animal and especially a deer. Venison can be used to refer to any part of the animal, so long as it can be consumed, including the flesh and internal organs. Venison, much like beef or pork, is categorized into specific cuts, including roast, sirloin, and ribs. The word derives from the Latin venari (to hunt or pursue). This term entered English through Norman in the 11th century, following the Norman conquest of England, and the establishment of Royal Forests. Venison originally described meat of any game animal killed by hunting, and was applied to any animal from the families Cervidae (deer), Leporidae (hares), and Suidae (wild pigs), and certain species of the genus Capra (goats and ibex). In Southern Africa, the word venison refers to the meat of antelope. There are no native Cervidae in sub-Saharan Africa. Venison may be eaten as steaks, tenderloin, roasts, sausages, jerky and minced meat. It has a flavor reminiscent of beef, but is richer and can have a gamey note. Venison tends to have a finer texture and is leaner than comparable cuts of beef. However, like beef, leaner cuts can be tougher as well. Organ meats of deer can also be eaten. Traditionally, they are called umbles (originally noumbles). This is supposedly the origins of the phrase "humble pie", literally a pie made from the organs of the deer. Venison is widely considered by modern nutritionists to be a very healthy meat for human consumption. Since deer are inherently wild animals living on a healthy diet of grass and wild plants, their meat is all-natural and hormone free. Venison is higher in moisture, similar in protein and lower in calories, cholesterol and fat than most cuts of grain-fed beef, pork, or lamb. Since it is unknown whether chronic wasting disease (CWD), a transmissible spongiform encephalopathy among deer (similar to mad cow disease), can pass from deer to humans through the consumption of venison, there have been some fears of contamination of the food supply. Farmers have had tests developed especially for the particular species they raise to obtain better results than those used on cattle. Hunters are advised not to shoot a deer that appears sick or is acting strangely and are also advised to take general precautions in examining the meat from deer they have killed. Venison jerky can be purchased in some grocery stores or ordered online, and is served on some airlines. Venison burgers are typically so lean as to require the addition of fat in the form of bacon, olive oil or cheese, or blending with beef, to achieve parity with hamburger cooking time, texture, and taste. 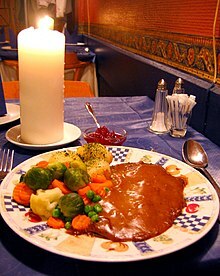 Historically, venison was considered to be a status symbol among many Europeans. In England, for example, hunting rights were restricted in an effort to preserve property rights. As a result, the possession and sale of venison was tightly regulated under English law. Venison is widely available in European supermarkets through the traditional hunting season, October to December. The main cuts available to European consumers are derived from the saddle and the hind leg. In the United States, venison is less common at retail due to the requirement that the animal be first inspected by USDA inspectors. There are very few abattoirs which process deer in North America, and most of this venison is destined for restaurants. Most venison sold through retail in the United States comes from New Zealand and Tasmania. It is available through some high-end specialty grocers and some chains which focus on more 'natural' meats. Non-retail venison is often obtained through hunting and self-processing or contracting to small meat processing facilities to do the processing for the hunter, but sale of the finished meat is usually illegal. Arby's gained some attention in October 2016 when word leaked through social media that they were about to test a venison sandwich. Arby's later confirmed the offering, selecting 17 stores in Georgia, Michigan, Minnesota, Pennsylvania, Tennessee, and Wisconsin (all major deer hunting states) to offer it during a four-day test during those states' respective hunting seasons. Both due to curiosity and heavy demand from hunters, the sandwiches sold out in all markets on the first day of the test. Venison consumption is sometimes stigmatized by reference to the 1942 Disney movie "Bambi," which personifies wild deer and includes a scene where the title character's mother gets shot and killed by a human hunter. The film implicitly portrays hunters as cold-hearted and anti-conservationist. Controversy was somewhat renewed when Disney released a long-awaited sequel to the movie in 2006. Nevertheless, there has been an increase in acceptance and promotion of venison in recent years due to the cited nutritional benefits of wild meat and a growing trend toward the belief that hunting an animal for its meat is more environmentally "correct" than the production of meat through factory farming. ^ "Venison – Definition and More from the Free Merriam-Webster Dictionary". Merriam-webster.com. 31 August 2012. Retrieved 12 November 2013. ^ Bull, Gregory Simon (2007). Marketing fresh venison in the Eastern Cape Province using a niche marketing strategy (PDF) (MTech). Nelson Mandela Metropolitan University. p. xcix. Retrieved 21 March 2013. ^ Suzanne Driessen (10 November 2003). "Wild Game Cookery: Venison". Archived from the original on 20 January 2010. Retrieved 29 July 2009. ^ "Nutritional and chemical composition of farmed venison". Journal of Human Nutrition and Dietetics. 8: 441–446. 28 June 2008. doi:10.1111/j.1365-277X.1995.tb00339.x. Archived from the original on 29 June 2012. Retrieved 12 November 2013. ^ Harper, Douglas. "Online Etymology Dictionary". dictionary.com. Retrieved 5 September 2014. ^ "New noumbles of Deer (recipe) – Cunnan". Cunnan.sca.org.au. 10 June 2004. Retrieved 12 November 2013. ^ Belay ED; Maddox RA; Williams ES; Miller MW; Gambetti P; Schonberger LB (June 2004). "Chronic Wasting Disease and Potential Transmission to Humans". Emerging Infectious Diseases. Centers for Disease Control and Prevention. 10 (6). doi:10.3201/eid1006.031082. Retrieved 2016-05-02. ^ LaCombe, Michael (2012). Political Gastronomy: Food and Authority in the English Atlantic World. Philadelphia: University of Pennsylvania Press. p. 84. ^ Sterba, Jim (18 October 2013). "If Only Hunters Could Sell Venison". The Wall Street Journal. Retrieved 13 December 2014. ^ Whitten, Sarah (8 November 2016). "Arby's venison sandwich a hit with hunters, quickly selling out". CNBC. Retrieved 8 October 2017. 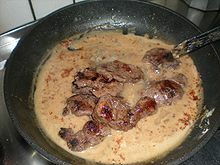 Wikimedia Commons has media related to Venison.